Hatters boss Nathan Jones won’t be second guessing just how League Two strugglers Cheltenham will set up against his side at Kenilworth Road this evening. The Robins are currently third bottom in the table, having only won once in their last six league matches, but when asked how he thought Gary Johnson’s side would approach the contest, Jones, who will be back in the dugout tonight, said: “I’ve no idea, absolutely no idea. I can’t second guess what any other team is going to do, what I can do is prepare mine in the best way possible. “We’ve got an idea of systems they play and how they play and who’s doing well as obviously we do our due diligence, but in terms of what game-plan they’re going to come with, I’ve no idea. 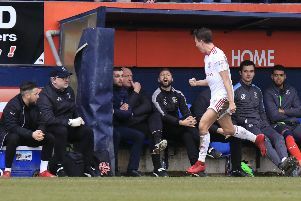 “It’s about us again, we worry about what Luton Town can do and if they come and do one thing, then hopefully we have enough to combat that,. “If they want to do something else, then we have a threat that we can hurt them that way. “I think we saw a contrast in performance both halves on Saturday where Cambridge sat back and had an organised press, and we managed to get on top of that and score. “Then they came out a little bit, matched us up, went for it, and we were devastating on the counter attack. Hatters now face a trio of sides on home soil where they will be expected to garner all three points, with Crawley and then Hartlepool visiting during February. However, Jones didn’t think where Town’s opposition are in the table had any bearing on the result, as he continued: “If you’ve seen the results we’ve had anyway, against the top seven sides, we’ve got the best record for playing each other. Centre half Glen Rea should continue alongside Scott Cuthbert in the heart of defence after the pair helped gain only Luton’s second league clean sheet in front of their own fans at the weekend. On the summer signing from Brighton, Jones said: “Glen Rea an outstanding young player, I love him, I knew that when I was at Brighton. “He was probably just on that periphery of being good enough to get into Brighton’s first team as they had wonderful players there. “But I knew any opportunity I got in management, I knew I was going to take him with me as he’s a wonderful player. “He’s versatile, he’s committed, defends well and he’s been outstanding for us, absolutely outstanding for us. Meanwhile, Jordan Cook knows his side can’t afford to take anything for granted despite the Robins’ poor form, as he said: “We’re starting to get results and should be winning against these sorts of teams, any team really. “We don’t go into any game thinking lets hold out for a draw, we think lets go and win. You see the gaffer at 1-1, putting strikers on, trying to win it, that’s just the mentality that he is and what he wants us to think like, all the time. “You’re always going to create chances and it’s just a matter of putting them away. “You’d think so (Luton should beat Cheltenham), but I know a couple of their lads and they’re top, top players. “They can create a chance out of nothing, they’ve got their own style and Gary Johnson, I remember going to Yeovil with Gary and working with him. Meanwhile, Isaac Vassell is hoping to get another chance to showcase his talents upfront, adding: “Lets hope so, I’ve given myself a good chance of being in the starting 11, so I’ll look forward to Tuesday If I’m playing. “You always go into a game knowing what’s on it, but we can’t go in thinking we need, need to win this game, you can’t put that sort of pressure on.